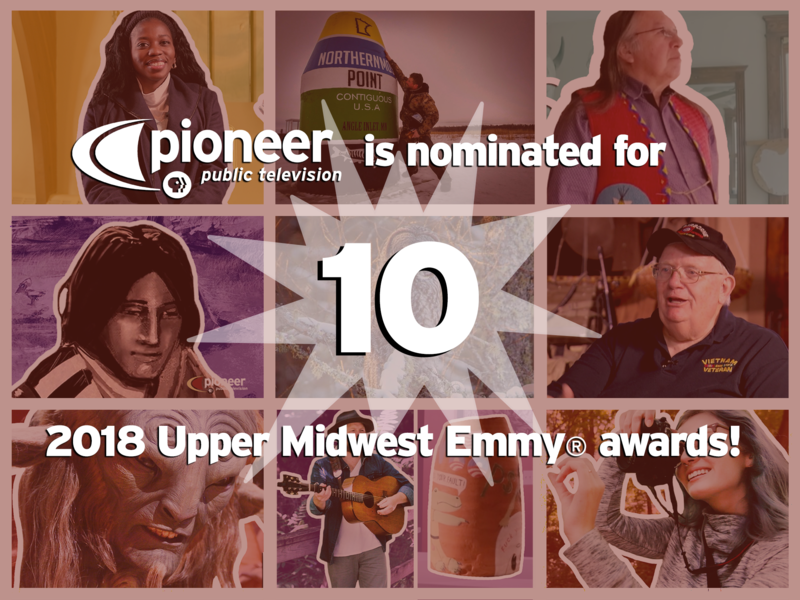 GRANITE FALLS, Minn — Nine locally produced videos and one program host from Pioneer Public Television have been nominated for Upper Midwest Emmy® Awards to be presented at the Emmy® Awards Gala hosted by the Upper Midwest Chapter of The National Academy of Television Arts & Sciences on October 6, 2018 in Bloomington. This is the most Upper Midwest Emmy® Award nominations amassed by Pioneer in the 52-year history of the station. Seven of the nominated stories are Postcards segments. They feature regional artists including Walter “Super” LaBatte of Granite Falls, Olga Nichols of Bird Island, Ella Kneprath of Hutchinson and Brady Perl of Long Lake. Other nominated Postcards videos center around national touring exhibits, including, “Mindful: Exploring Mental Health Through Art” at the Kaddatz Galleries in Fergus Falls and Guillermo del Toro’s “At Home with Monsters” exhibit at the Minneapolis Institute of Arts. Pioneer’s documentary, Vietnam Remembered: Western/Southwestern Minnesota, was nominated in the Historic Cultural/Nostalgic Category. Produced by Tim Bakken, the program features interviews with local Vietnam veterans including Dale Johnson of Underwood, Max Prinzing of Redwood Falls, Byron Higgin of Minneota, Wesley Smith of Madison, Jerry Eykyn of Worthington, Luverne Kortgaard of Willmar, Gerald Goetch and Jerome Parker—both of Ortonville. Pioneer’s Prairie Sportsman program was nominated in the Science/Environment Category for its episode on the Sax Zim Bog in northeast Minnesota. Prairie Sportsman host Bret Amundson was nominated for his role in the Host/Talent category. This is the first time that a local program host from Pioneer has ever been nominated for an award. It is also the first time that a Pioneer-produced animated short story has been nominated for an award. “Maya Bdeg’a,” a family legend that Walter “Super” LaBatte heard as a child, features original illustrations by graphic artist Tate Marshall. All of the nominated stories can be viewed online at: www.pioneer.org/emmys. Pioneer Public TV is an award-winning, viewer supported television station serving western Minnesota, the eastern Dakotas and northwestern Iowa. For more information, visit www.pioneer.org or call 1-800-726-3178.